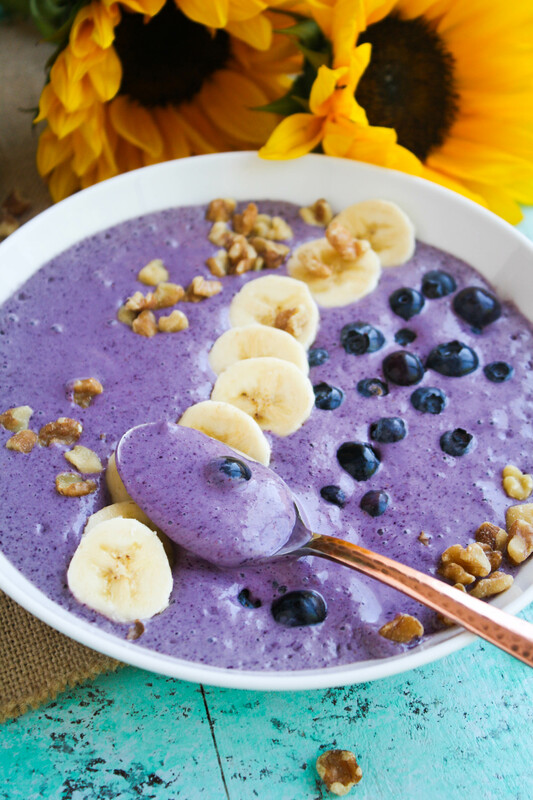 Blueberry Banana Walnut Smoothie Bowls are the perfect dish for breakfast! I’ve been eating a lot of smoothies lately, cuz, why not? They’re so easy to make and they keep you full practically all morning long. Lots of folks reach for eggs in the a.m., like my Zucchini-Thyme Frittata for Two, or maybe they’ll whip up a dish like my Blueberry Dutch Baby Pancake. Both are filling and easy-to-make meals. I go those routes, too, because I like options in the morning! Lately, I’ve been eating so many blueberries that I’ve worried a little about potential adverse effects (like turning blue)! Fortunately, that hasn’t happened. I mean, it’s hard to resist blueberries, especially in smoothies! 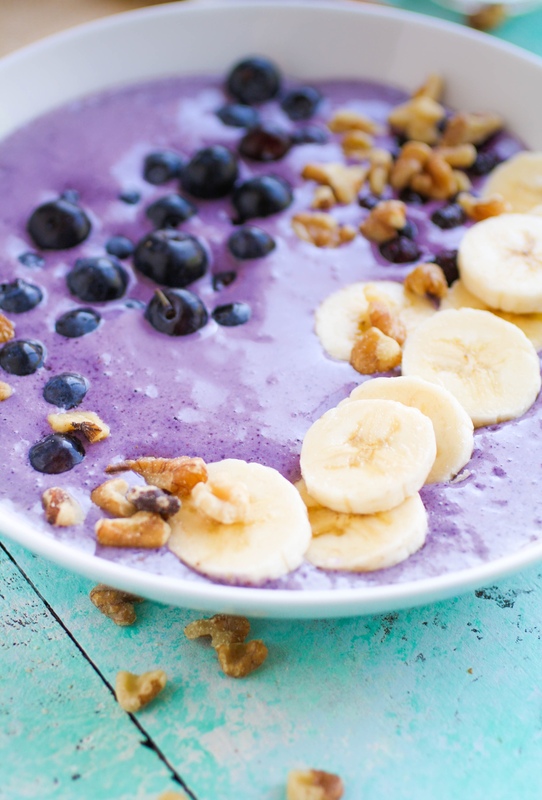 Blueberry Banana Walnut Smoothie Bowls are a fun breakfast dish. Yes, literally a dish. I served these smoothies in bowls instead of adding them to glasses to sip with straws. Just pick up a spoon and enjoy! Walnuts might not seem like standard fare for smoothies, but why not? They’re rich in fiber, protein, and the “good” fats. Just toast ‘em up a little bit first. Another breakfast dish I adore is Cherry, Almond & Coconut Overnight Oats with Chia. Nothing like having breakfast ready to go right when you hit the kitchen! Maybe you’re a granola fan. Whether you like to eat it with milk, yogurt, or just by the handful, my Chunky Cherry-Chai Granola is super tasty! Back to these smoothies: just a handful of ingredients whizzed up in the blender, and breakfast is ready. I included chia seeds in this smoothie. They’re so good for you, and you’d never even know they were there. This recipe made two BIG bowls, but you could easily divide and conquer with four smaller portions. I love to add banana to my smoothies, too. It’s another fruit that makes a frequent appearance in my smoothies. If you love bananas, too, you might like my Cashew and Banana Smoothies. They’re super simple and super tasty. For these Blueberry Banana Walnut Smoothie Bowls I added a little something to sweeten them slightly. I used one pitted date (next time, maybe two would be better), but if you don’t have dates on hand you can use honey, agave nectar, or whatever sweetener you like. 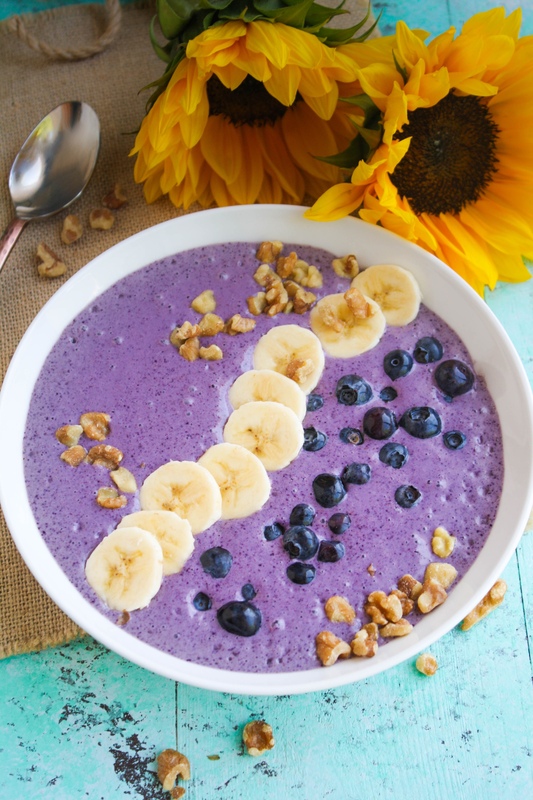 Take it from me, Blueberry Banana Walnut Smoothie Bowls will bring a smile to your face for your first meal of the day. Mix some up this week! Pour into bowls and top with the remaining banana, sliced, and the walnuts as garnish. I might have to make this for breakfast now! Sounds absolutely delicious and refreshing. 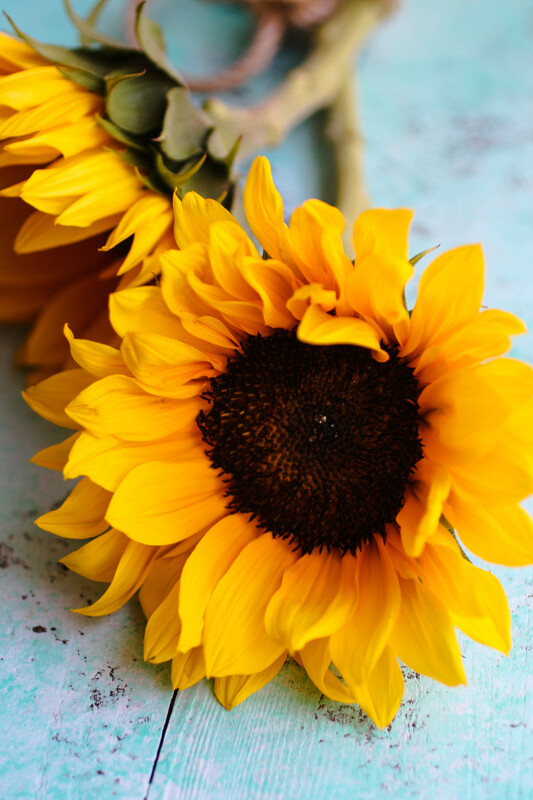 I also LOVE those sunflowers!! Thanks so much, Jessica! I love sunflowers, too. Always so cheery! Enjoy! What lovely photos! I love the flavors of blueberries and bananas together. I know my kids would love this too. I can't wait to try your recipe. Thanks so much, Audrey! I really love the color (and flavor), too! Enjoy! I've recently started to make smoothie bowls for my daughter and this has to be her new favorite. It's such a beautiful breakfast to wake up to, it tastes great and I know she's (we're) eating something healthy to start the day. That's so great to hear, Joanie! I'm so glad you both like this one! Love the addition of walnut to these smoothie bowls! it's the perfect flavor combination! Okay, I am making this for lunch today! Looks soooo delicous, I'm obsessed with smoothie bowls and the colour of this one is beautiful! Thanks a bunch, Krystin! I hope you enjoy your pretty lunch! Chia seeds are a go-to for when I make smoothies as well! I love the idea of putting walnuts in the smoothie bowl, honestly it would add such a great crunch. I am definitely going to have to try this one for breakfast! Thanks, Caitlyn! I know - a little something to crunch into is a good thing, I think! Enjoy! These bowls look so good! I love blueberries and banana! Those are usually my fruit ingredients in my smoothies! Thanks, Ashley! Well then you *must* give this one a try ;) Enjoy! Okay, I am totally in the mood for a smoothie bowl now! 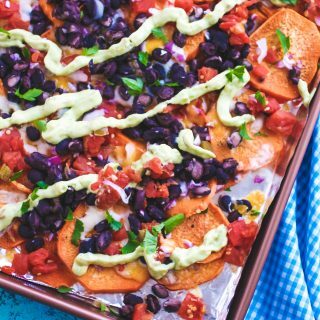 This looks amazing--saved it on Pinterest! Thanks, Cat! Haha! Isn't it funny how that works! I hope you try it soon, and enjoy! These look so delicious and refreshing for summer! I love super foods! Delicious! I'm looking forward to trying this one out! Thanks so much, Aysha! Enjoy! This looks delicious. I am trying to explore smoothie bowls or this summer . Thanks! Thank you, Dominique! I hope you give this a go and enjoy! This is such a refreshing breakfast in the warmer weather! I love it. Thanks so much, Taryn! Yes, a great summer breakfast dish! This looks super delicious and very little ingredient to make it. 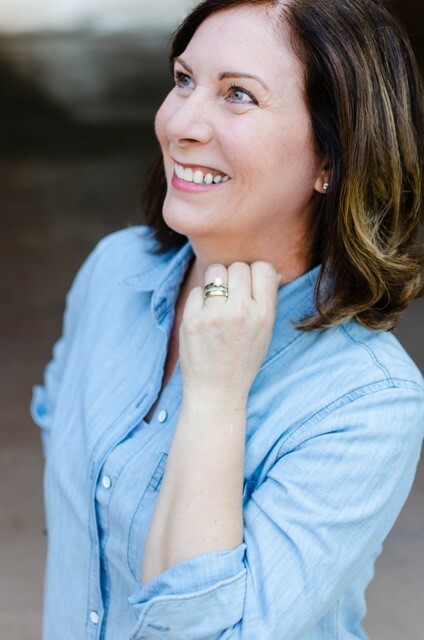 Thank you, Luci! Yes -- just a few ingredients for a great breakfast! Oh wow! Not only is that gorgeous, but it looks and sounds delicious! I need to try this for breakfast soon! Thanks, Kristin! I hope you enjoy this! Wow, this looks amazing! Will they be okay if I make them the night before? I have to get up for work at 4 in the morning, and I usually try to make breakfast the night before to maximize my sleep. Hi Victoria - thanks so much! I think you could blend the smoothie, maybe put them in a mason jar, and wait until morning to add your toppings! Enjoy! I am pinning this because this looks delicious. Not only are these bowls pretty but they are so delicious! I loved the addition of walnuts because I'm all about texture and my problem with smoothies is that they are, well, smooth, lol! I like the little bit of crunch from the toasted walnuts! Thanks, Amy! Yes, those walnuts will do just the trick! Patricia! This looks AMAZING! 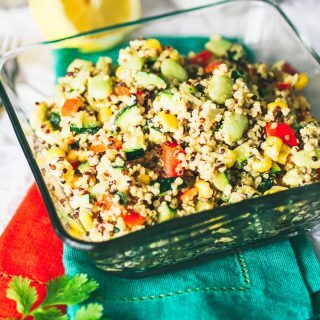 So light and healthy for summer. Thanks, Helen! Yes, it's a great summer breakfast! I always want to make smoothie bowls!! That's very interesting! I never thought to put a smoothie in a bowl. It looks pretty good! Thank you, Elizabeth! Yes, I hope you do! Looks yummy! Smoothie bowls are the perfect start to every morning! 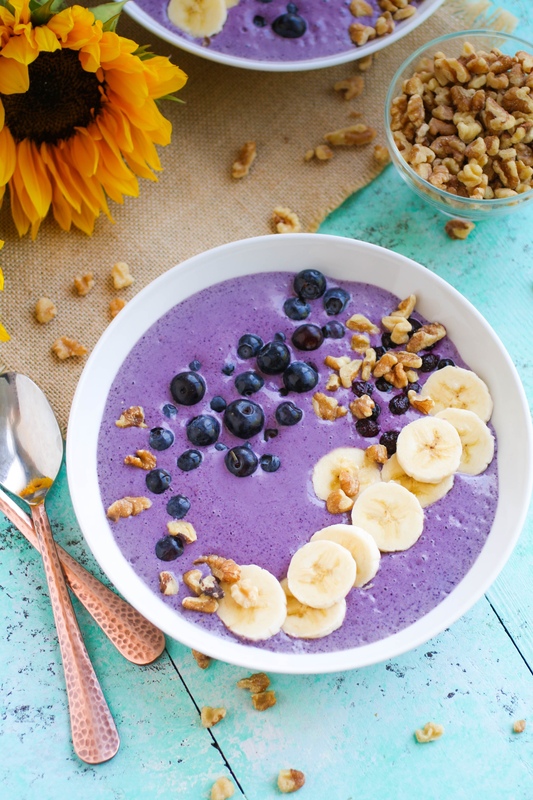 These beautiful and delicious blueberry banana walnut smoothie bowls were so delightful and refreshing! 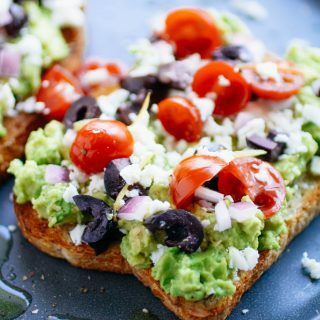 A quick and easy meal that brightens any morning! Wow this looks amazing!!!! I literally eat smoothie bowls almost every day for breakfast! They are the best! Thanks, Erica! I hope you give this one a go! Thanks so much, Ingrid! I hope you try it and enjoy!